A lot can change in the 454 days between now and Ireland's World Cup opener against Scotland in Yokohama but at this remove it is impossible not to feel optimistic about what Joe Schmidt's side can achieve in Japan. Even the nature of this historic series win over Australia fits into the journey towards that tournament. No one will get carried away with a 240-minute encounter that finished 55-all on aggregate and was in the balance until the final moments when the referee, players, the 44,085 fans in the stadium and the folks watching back home strained their eyes to see if Bernard Foley's pass had brushed off Jacob Stockdale's arm. The evidence was inconclusive, the hooter had sounded and the Landsdowne Cup was added to the Irish team's luggage for the flight home. The players will scatter through the globe on their well-deserved holidays, while the coach repairs to New Zealand for a series of engagements and some family time before reflecting on a near-perfect year. He has kept an eye on events elsewhere and noted the improvements of his rivals. 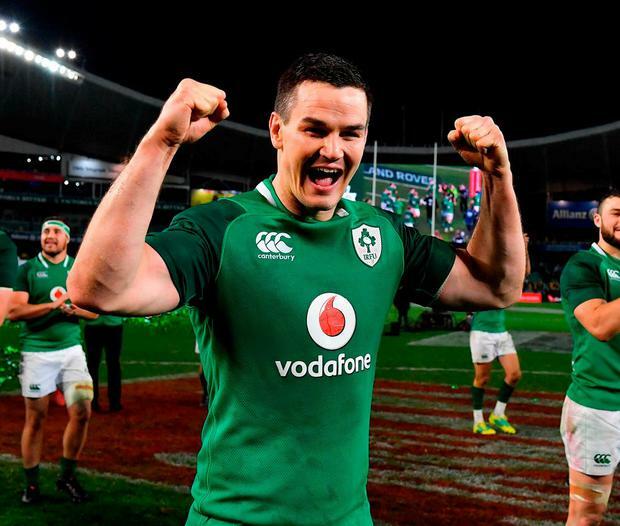 Everyone is ramping up for 2019 now and Ireland's mission is to build on this success once they have taken a breather. "I'm kind of intimidated by the season because how do you repeat that?" Schmidt said. "It's tough to go again and with that expectation. We have that expectation of ourselves that we're going to try to keep working and try to keep improving. "We don't want to be one hit wonders, but while we have earned where we are tonight, in the scale of things, we want to keep growing. "It is so fickle, so competitive and I know how quickly it can turn. "This time two years ago, England won a Grand Slam and they went one better than us, they won 3-0 here against Australia. "Until Saturday's win, they had lost their previous five Test matches and throw in the Barbarians result there, too. They have had to keep their heads above water. It's not easy. There are so many good teams out there." No Irish team has put together a body of work like this one and they did it while replenishing the squad with a new generation of winners. Including the June tour last year, Schmidt has handed out 14 new caps while winning all but one match and his investment in youth has reaped dividends. That was summed up by Jordan Larmour's hugely influential role in the finish. 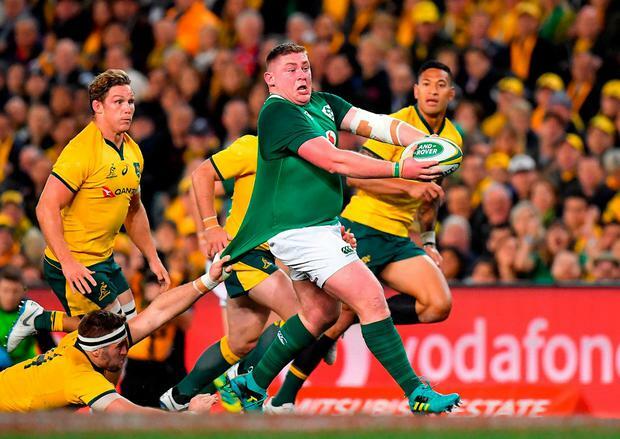 While all about him looked fatigued, the 21-year-old was hungry for the ball and as the tide turned against his team he refused to give; winning a high ball above Israel Folau, eking out hard yards with his footwork and his energy lifted those around him for a final hold-out. Schmidt's newest cap, Tadhg Beirne, played a role as well, and while they lost their captain before the tour and their stand-in mid-way through the first half, they never missed a beat. Once their anger over the refereeing has abated, Australia will view this as a blown opportunity. They went into the final quarter of the decider with the momentum behind them but couldn't put Ireland away. Some of their complaints about Pascal Gauzere's display were justified, but the win was in their own hands. Michael Cheika invited the French official into the press conference to explain some of his big calls including the decision to issue Israel Folau with a yellow card, penalise Tolu Latu for Johnny Sexton's insurance penalty and the big one at the end but, unsurprisingly, he declined. Across the summer series, refereeing and the role of the Television Match Official has been a controversial topic and World Rugby have a job on their hands to prevent officiating from being the major influence on proceedings at next year's big show. Cheika is trying to foster a "no excuses" culture and tried to avoid directly blaming the referee, but it was hard to escape his frustration. "The key word these days is clear and obvious, I don't know anything that is clear and obvious in a game of footy," he said. "I'm not sure how you can clarify it any more or less, rugby has no black and white. There's a lot of grey, it's about interpretations of the grey." At the end of it all, his side have made progress but come up short against a team who justified their place in the world's top two but know full well how skinny the gap is between the top tier sides. "Credit to Ireland through the series, they have been tough," David Pocock said. "Their game management has been really good, you don't become No 2 in the world for nothing, it finishes a really good year for them. But, for us, it's really disappointing." Having dealt with injuries, the late withdrawal of Sean Cronin, a delayed bus journey that conjured up memories of last year's Murrayfield disaster, Schmidt can be happy with how this pre-World Cup stress test has gone. "I know my stress levels were high," he said when it was put to him that they had survived through adversity and sifted through the moments in the game just past. In August, he'll regather the troops in Carton House and task them with improving on this season. "You can't maintain things. You've got to try to get better," he said. First, they can finally have a break and reflect on a remarkable season and a historic achievement of claiming a first series here since 1979.